Terminologia Anatomica - want to learn more about it? From a historical point of view, anatomy can be considered as the first exact field; its terminology is a crucial base for many scientific disciplines. The origin of anatomical terminology dates back to the ancient period, more than 2,500 years ago, and was described in the common languages of that time: Greek, and later Latin. This principle has endured and serves as a base for the modern-day anatomical nomenclature. Greek and Latin medicine established the foundation of anatomical terminology which varied with different authors. Most of the anatomical terms are different from colloquial words, and have changed since ancient times. Hippocrates (ca. 460-370 BC), in Greece, introduced terms such as acromion, bronchus and peritoneum. Aurus Cornelius Celsus (25 BC – 50 AD), in Rome, used cartilago, patella or sutura. Cladius Galenos of Pergamon (129/130 – 199/200 AD) introduced new terms such as aponeurosis, coccyx, epiphysis, hypophysis, epidermis, pylorus. Friedrich D. J. Henle (1809 - 1885) was the first to simplify anatomical terminology. Terms such as “medialis, and lateralis” were introduced by him to describe the appropriate orientation and direction of anatomical structures. Terminologia Anatomica, in a broad sense, is a list of terms that pertain to the anatomy of the human body. It has been the subject of much controversy and disagreement. Previously, the International Anatomical Nomenclature Committee has been responsible for the production of six editions of Nomina Anatomica. The Nomina anatomica (6th edition in 1989) was the standard anatomical nomenclature until recently. This has been succeeded by the Terminologia Anatomica by resolution of the International Federation of Associations of Anatomists (IFAA) in 1999. The IFAA was founded in 1903 and its membership comprises anatomical societies and associations worldwide. It represents and coordinates all aspects of anatomy and the anatomical sciences. 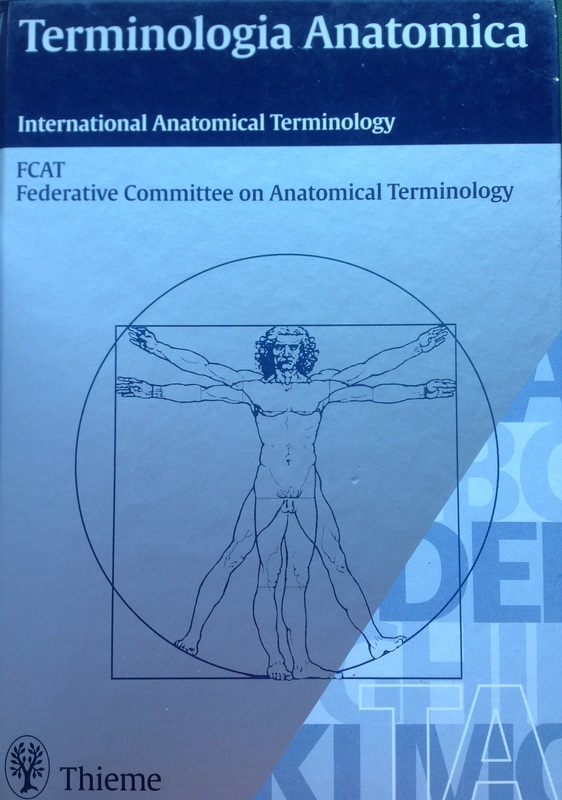 FIPAT, the Federative International Programme for Anatomical Terminology (formerly known as the Federative Committee on Anatomical Terminology, FCAT), deals with the official international standard set of human anatomical terminologies. It is one of the six major fields of activity of the International Federation of Associations of Anatomists [IFAA], the world body of Anatomy. The others are Education, Ethics and Humanities, Research, Supranational Projects and Scientific Publications. FIPAT worked for 9 years and published Terminologia Anatomica in 1998. It's aim was to further standardise the anatomical terminology, also internationally, and especially to democratize it; i.e. to ensure that it accommodates the needs of clinicians and medical scientists, thus making it the living language of anatomy. Worldwide adoption of the same terminology would eliminate national differences, which were causing extreme confusion in instances where the same structure was known by several names. The new terminology is thus the result of worldwide consultation and centres around the latin nomenclature with equivalent English terms provided. It is indexed in Latin and English and contains an index of eponyms in order to find the correct non-eponymous term. The number of anatomical terms now recorded in “Terminologia Anatomica”, contains nomenclature for more than 7500 human gross (macroscopic) anatomical structures. This growth in numbers is caused mainly by the insertion of clinical anatomical and neuro-anatomical names. A number of incorrect or misleading terms have been replaced. Each Latin term has a unique code number and is supplied with an English equivalent (International anatomical terminology; IAT) the spelling of which in either UK English or American English is considered equally correct. Based on the Terminologia Anatomica, every language can formulate its own anatomical nomenclature centered on the standardised Latin terminology. The nomenclature is presented per system or organ tract. An alphabetic index follows Terminologia Anatomica as well as the English IAT list. FIPAT have also developed similar terminologies for specific disciplines which fall under the wider umbrella of human anatomy i.e. terminologia embryologica, terminologia neuroanatomica, terminologica histologica, terminologica anthropologica etc. Thus, Terminologia Anatomica "can be described as the international standard on human anatomic terminology developed by the Federative International Programme for Anatomical Terminology (FIPAT) and the International Federation of Associations of Anatomists (IFAA) and was released in 1998”. A second edition of Terminologia Anatomica is currently underway, due to be released in 2018/19. K.L. Moore and A.F Dalley: Clinically Oriented Anatomy, 5th edition, Lippincott Williams & Wilkins (2006), p. 2, 4. S. Ngai: Understanding Anatomical Latin (accessed 17/10/2015). Terminologia Anatomica: International Anatomical Terminology. New York: Thieme Medical Publishers (1998).